See also TESLA by DIES (KAYOver), De Auto Van De Toekomst by sjon111. Scifi font based on the Tesla Motors storefront. I wondered what a full font set based on that theme might look like. All caps, wide font, with open design and strong horizontal lines. This is my first font and I'm going to go ahead and publish it as it's pretty much done, but I might tweak it some as things go on. If you use this font please drop me a line - I'd love to see how it's used in the wild... Hope you find this useful. Enjoy! Info: Created on 6th September 2012 . Last edited on 14th September 2012. I do like that “backward” E.
And, the width of the font should be same and balanced, you can use helping line by pressing "U" on the FontStructor. thanks for comments. I've vacillated back and forth on it, but I'm just gonna go with my gut and use the backwards E. It's just got more character and weight, even though it might cause reading problems in certain situations. Good first font! Remember to keep a consistent style, now the numbers don't quite match the letters. 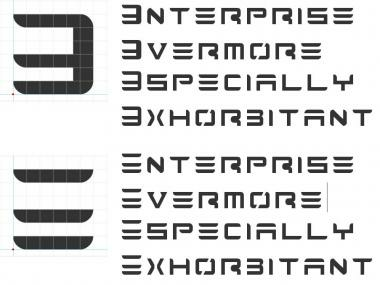 If I were you, I'd erase the extra bricks on the capital E's vertical stem to make it the same width as the horizontal bars on the E. For me, it diminishes the consistency. I like E in the word "Especially" on the 3rd line of your first sample. Hi demonics, I put the thinner reverse E back in there. thanks for your comments. thanks for comment. Wish I could do better on the N and Z, with fat diagonals, but don't really know how. I might also change the R.
Can you do ARCADIA for me? It looks very good, but the top bar on the Capital "A" is upside-down. Example of the proper "A"
Uniformity is the key to a successful font. Your capital "E" should resemble your lower case "e." All horizontal lines should end the same way. of your characters should all look the same way. There should be missing part of every letter that resembles an "A" or "E" in the exact same location the "A" and "E" are missing part of their lines. 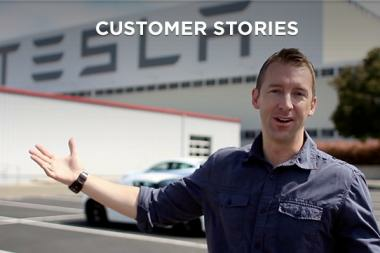 Your "s" does not resemble the "S" in the Tesla logo. Your "M" should have rounded corners at the top on both sides. Diagonal lines should have the same thickness as vertical and horizontal lines. The "M" should look like a rotated Tesla "E." Do not white out lines in the lower half of letters. Look at the Blade Runner font, and the Katie Che font. Look at this Blade Runner font. and look at this Katie Che font. Here are more characters from the original Tesla font set. I thick the Tesla "E" should be upside down to match the "A" from the font set you used. I think the "E" on the Tesla store front is "wrong." Trust my judgment. If you don't ask others. My graphic design judgment is infallible, my taste in art impeccable. I see there is a normal E and a backwards E. When I pull in the E in Photoshop, it only pulls in the backwards E.
How do I pull in the normal E? sorry for delay in reply. It's been a long time since I looked at it, but I think the "normal" E is from the lower-case set of letters. The reverse E is from the upper case. I think the set is modifiable if you need to change anything. So well done... I like the subtle differences between UC abd LC. Thx! I'm gonna use this on my youtube! !